Our Cheque Printing Software has very easy Graphical User Interface that makes our Cheque Printing Software very user friendly. The Cheque Printing Software offered by us is uncomplicated and magnificent printing software for printing your cheques more accurately and more rapidly. Corporate houses and fastest growing Companies find our software as an indispensable part of their management. Cheque Printing Software is fully functional and Personal software that will make your cheque printing job run faster and more easily. You can also print multiple cheques at a time. Thus you don't have to write every time, no need to alter the name or the amount of the cheques. The only task left is to print and sign your cheque. 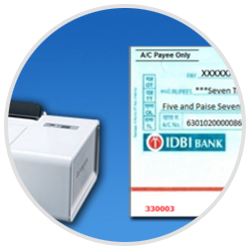 No need to buy any printer to print your cheques, our Cheque Printing Software is compatible with any other printer.